Robbery with a firearm is considered a serious offence if you have been charged or facing charges for robbery with a firearm seek expert legal assistance. George Sten & Co comprises a team of specialist criminal defence lawyers with over 50 years of experience in defending persons charged with crimes including robbery offences. If you have been charged with robbery with a firearm or a robbery offence, George Sten & Co maintain the expertise required to defend you to the highest possible standard. Division 2 (Sections 94-99) of the Crimes Act 1900 (NSW) provides for offences which involve robbery. The Crimes Act does not provide a definition of robbery. Rather, the definition is found in the common law and provides that a robbery is committed where “the victim is compelled by force or fear to submit to the theft”. Being armed with a firearm is an aggravated, or more serious form of robbery under Section 97 (2) of the Crimes Act. A firearm is defined as a “dangerous weapon” under this section. The seriousness of a robbery offence is determined by whether a weapon is used and if so, the nature of the weapon and the manner in which it is used. This means if a person is accused of using a firearm during the commission of an alleged robbery offence, the type of firearm and the way the accused person uses the firearm affects the seriousness of the offence and the penalty that will be imposed if they are found guilty. Furthermore the law provides that the seriousness of an offence increases where a firearm is loaded, if the firearm is discharged during the alleged robbery and where the alleged offender aims the firearm if it is discharged. This means if an offender aims a firearm at a victim or an important target, the seriousness of the offence is increased. Courts also take the view that firearms are more dangerous than other weapons such as a knife as they are more capable of causing death or grievous bodily harm. The law provides that it does not matter that a firearm may not be loaded – this does not mean the offence is less serious in nature. 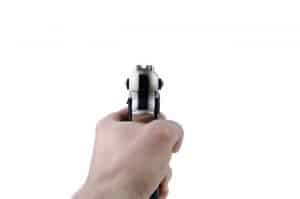 Where a firearm is found to be loaded when an accused person is arrested a short time after an alleged robbery, a court may assume the firearm was loaded during the commission of the robbery. A Court will also recognise that a replica firearm, whilst it may not pose a risk to victims of a robbery, is used for the purpose of causing victims to fear. This will maintain the seriousness of such an offence. Courts also take the view that robbery is not just a crime against property but also a crime against persons. Consequently, a judge will take into account the effect of the robbery on any victim(s) in sentencing an offender. Further, where an offender assures a victim they will not be harmed by a weapon, this will not alleviate the seriousness of the offence. This means that where an offender is below the age of 18 and, during the commission of a robbery offence, behaves in a way which increases the seriousness of the offence, their age will not serve as a mitigating factor or a factor which a judge will take into account as reducing the seriousness of the offence. Courts may take the view that if a juvenile behaves in a serious manner as an offending adult may, then the law will treat them as an adult. Robbery with a firearm is an extremely serious charge and where a person is found guilty of this offence, a judge will impose a sentence which reflects the seriousness of the crime. For this reason, it is essential a person charged with robbery with a firearm is defended to the highest standard to ensure the best outcome is achieved. This offence requires specific elements to be proved by the Crown before a person may be found guilty. Unless those specific elements are proved then the crime cannot have been committed. A specialist criminal defence lawyer is able to test the Crown’s evidence against the facts and properly argue for an accused person. In New South Wales the Crimes Act provides for a number of offences which involve a robbery of some kind. If you have been charged with, robbery with a firearm offence, it is crucial that you seek urgent legal advice. For specialised criminal defence lawyers, contact George Sten & Co Criminal Lawyers.